BETTER PRODUCTION Shops Using Technology 102 MMS September 2017 mmsonline.com c a n set up the machine in le s s tha n half a n hour. The two men are working on applying this system to other machines. According to Mr. Forschner, this will also reduce the number of components that need to be stored in the com- pany's warehouse, reducing inventory costs. "The shorter setup times are already a big step towards the efficient manufacture of very small batch sizes, which would definitely increase our competitive- ness," he explains. 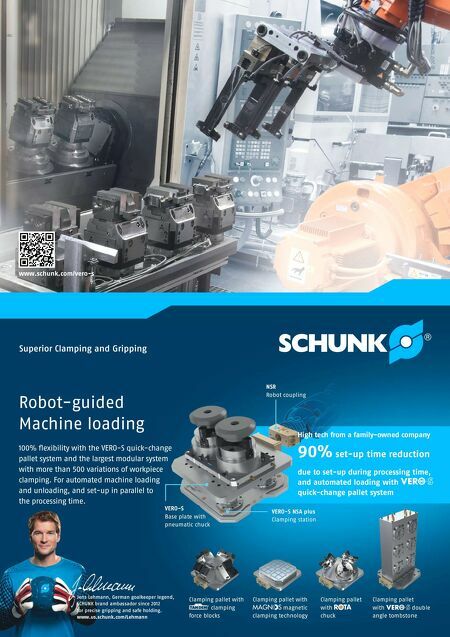 The smaller the batch sizes, the greater the need for increased production reliability at optimum speed, Mr. Schmid says. Before working with PiWeb, Metabo employees had to collect the necessary data for controlling their processes from different systems, which was time-consuming. "Now all our data are stored centrally," he says. "This is a huge relief for everyone." He also says that the layout of reports from the software is easier to read compared to the old solution, enabling workers to identify problems faster. 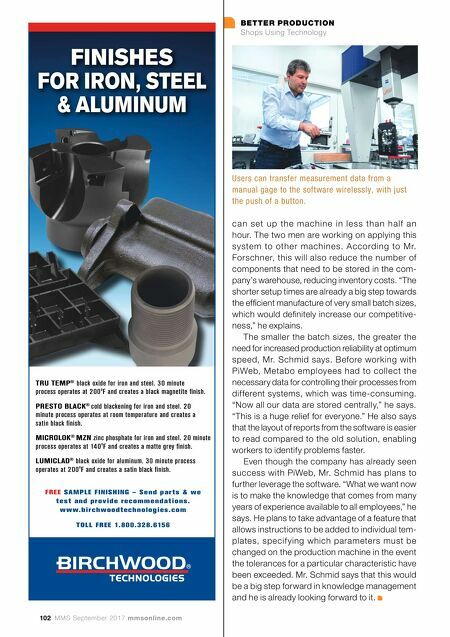 Even though the company has already seen success with PiWeb, Mr. Schmid has plans to further leverage the software. "What we want now is to make the knowledge that comes from many years of experience available to all employees," he says. He plans to take advantage of a feature that allows instructions to be added to individual tem- plates, specif ying which parameters must be changed on the production machine in the event the tolerances for a particular characteristic have been exceeded. Mr. Schmid says that this would be a big step forward in knowledge management and he is already looking forward to it. FINISHES FOR IRON, STEEL & ALUMINUM FREE SAMPLE FINISHING – Send parts & we test and provide recommendations. www.birchwoodtechnologies.com T OLL FREE 1.800.328.6156 TRU TEMP ® black oxide for iron and steel. 30 minute process operates at 200 o F and creates a black magnetite finish. PRESTO BLACK ® cold blackening for iron and steel. 20 minute process operates at room temperature and creates a satin black finish. MICROLOK ® MZN zinc phosphate for iron and steel. 20 minute process operates at 140 o F and creates a matte grey finish. LUMICLAD ® black oxide for aluminum. 30 minute process operates at 200 o F and creates a satin black finish. Users can transfer measurement data from a manual gage to the software wirelessly, with just the push of a button.